With only three weeks to prepare for the match up, Suggy’s Gym professional boxer Fergus Taylor took on former England captain and 2012 senior ABA lightweight champion Josh Leather in a light welterweight contest at the Hilton Hotel in Mayfair on Monday 24 November. 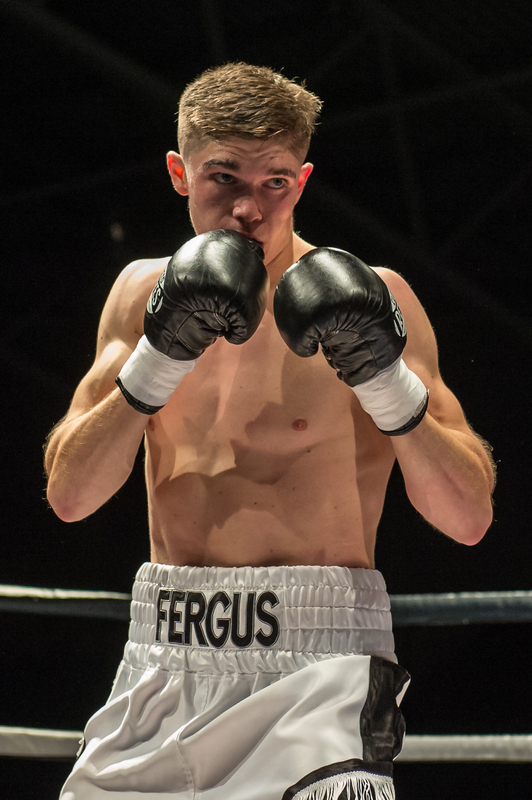 Pushing the pace from the first round, Fergus took the centre of ring, using some good body shots and taking it to the unbeaten Leather who was trying to out-point the Suggy’s Gym fighter with his movement and boxing skills. The rounds went back and forth but to the same pattern until the end of the third, with the two boxers clearly thinking they were in a contest that could go either way. Both fighters started well in the fourth but Josh appeared to have turned it up a gear. Combining his footwork with some strong, straight right hands and a fast jab, he seemed to win this round with good skills. Finding his rhythm again in the fifth, Fergus began to put the pressure on by changing the levels, although Josh was still responding with good lateral movement and counters. At this point, the crowd was cheering both fighters, recognising that this was for real and that each one wanted the win. Fergus came out all guns blazing in the sixth and final round, managing to catch Josh more and more. Both men were landing good shots but it was clear that Josh was under pressure and was being forced to step it up too with his movement and punches. At the end of the bout the crowd cheered a hard-fought contest. The victory was awarded to home fighter Josh on points but, despite gaining his first pro defeat, Fergus remained positive about his future prospects. Dean Sugden, head coach of Suggy’s Gym, added: “Ideally we like six weeks to prepare for any fight but the offer for this one came in just a week before Fergus’s last outing in Sheffield on 14 November. “With only ten days between the two fights, I knew we wouldn’t have time to prepare for a boxer like Josh; although his style is still very much that of an amateur, he uses his speed and movement to good effect.